While save-the-date announcements are not an absolute requirement for the modern wedding, they have come to serve a purpose in our all-too-busy world: They give your valued guests a generous amount of notice so they can plan ahead for your big day. For the cost of economy store-bought cards, in this DIY project, we'll make elegant cards with a personal touch. When I made my own bookmarks for my fairy-tale event, I spent about the same amount of money as I would have to buy mass-produced cards that looked as cheap as they actually were; instead, I used the money for supplies I would also use on invitations and beyond, while achieving a high-end custom look. Skills I used included basic stamping, decorative cutting and simple matting techniques I had already honed through card-making and scrapbooking crafts. I encourage you to use these instructions as a spring-board to creating your own unique craft. Note: You will also need to have access to a computer and printer, along with an engagement picture to which you have the rights. Choose some design elements that you intend to carry throughout your other DIY paper craft items you'll be using for your wedding, such as invitations, ceremony programs, reception place cards, and thank you notes. You'll want to decide on colors, fonts, and any other thematic elements you plan to use. This website: www.dafont.com is a good source for fonts, or you could even pay to create a font based on your handwriting at www.yourfonts.com if you like it. As you can see from the pictures, I chose forest green, ivory, and tan as my colors, and I attained a somewhat formal look by combining a classic script font with a very clean-edged print. I also incorporated elements that seemed to go with ivy, which was something I planned to use in my wedding day décor. In addition, I used a single monogram stamp, but if you like designing graphics yourself or know someone who does, you can create your own special monogram in a graphics program, or even in Microsoft Word. For a traditional 3-letter monogram, you'll want to use the groom's first initial on the left, the bride's on the right, and a large last initial in the middle; or, for a more casual look, you can just intertwine your first initials. 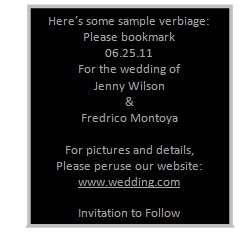 This website www.marrymonograms.com can give you some ideas. Figure out the size you want your bookmarks to be, how many will fit on a sheet of card stock, and how many you'll be making. I made mine 2¾" x 8½" so they would fit inside a No. 10 envelope without too much room to spare. You can see the bookmark laid on top of a business envelope in the picture nearby. That gave me three per 8½" x 11" sheet of card stock. I also ordered both. 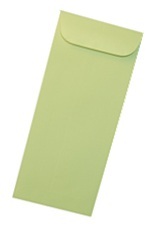 If you don't want your envelopes to look too business-y, you might want to use "policy envelopes," which open on the short end, instead of the long end, like these chic linen pastel ones available from envelopemall.com. 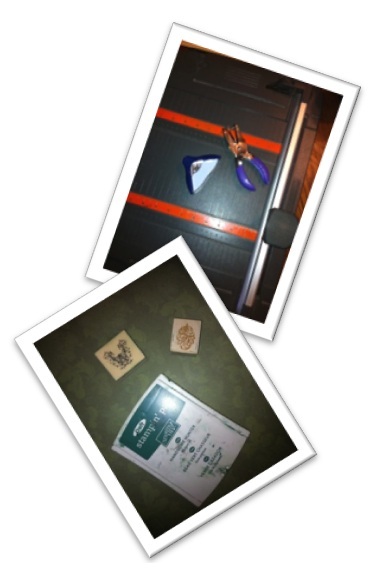 You'll also want some extra card stock for matting the printed or stamped squares. It's a lot more difficult to cut around already printed areas, so if you do choose to design your own monogram, you'll want to format the page very carefully or consider purchasing clear labels to place on the already-cut squares. Lastly, figure out how much ribbon you'll need, and cut it into even lengths. I used about 8" for each bookmark. You'll want to format the content so that several will print per page, which is probably easiest if you use a text box and an object and group them, in Microsoft Word. Then you can copy the "grouped object" multiple times, per page. You'll want to allow for a little "white space" around the edges. I recommend using small boxes, bowls, or bins to keep the different parts separate and to do all of one type at a time. You may even want to label each container. If you're having a large wedding, you may want to invite some friends over to help. • Round corners for both bookmarks. Note: If you're doing more than 50 of these, you may want to consider having some cuts made at an print shop; they usually charge about $1 per cut, no matter how many pages they're cutting. Stamp the monogram and other decorative stamp on your "color 3" square. Attach each stamped or monogrammed "color 3" square to a "color 2" square. 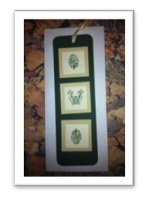 Attach each matted "color 3" square to a "color 1" bookmark. 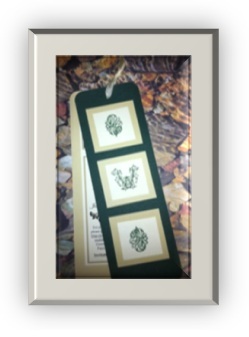 Attach each "color 3" rectangle to a "color 2" bookmark, running a ribbon through the hole, and knotting it. Whew! That was a lot of work! But for the same amount of money, or less, than you could have spent for boring save-the-date cards, you have a custom look that lets your guests anticipate the festivities to come! Tammy Wagner is currently a stay-at-home wife and mommy to two little boys. During naptimes and after bedtimes, she does some freelance writing, blogging, and crafting. She also loves to use her talents to serve the Lord and plan weddings and other special events for family and friends. 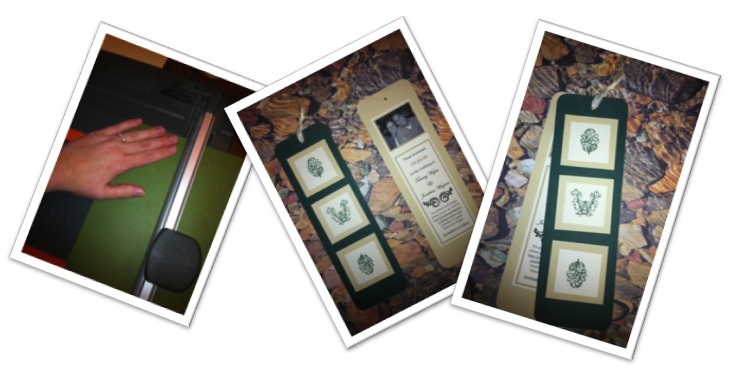 She'd love to see your rendition of these save-the-date bookmarks! You can contact her or read more through her blog, www.tammymommy.blogspot.com. She also writes as "Tammy Mommy" at www.goodblogs.com.